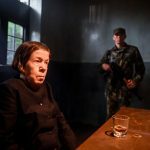 “Warriors of Peace” – Callen pursues every alternative when the Diplomatic Security Service apprehends his father, Nikita Aleksandr Reznikov (Daniel J. Travanti), as part of an exchange for two American photographers being held hostage in Iran, on NCIS: LOS ANGELES, Sunday, March 25 (9:00-10:00 PM, ET/PT) on the CBS Television Network. 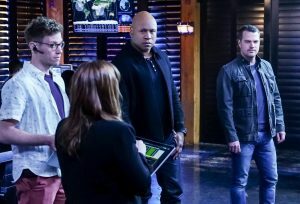 “Liabilities” – Callen and Sam pull Granger’s daughter, former spy Jennifer Kim (Malese Jow), from witness protection to help the team locate an underground spy who has obtained an arsenal of bomb materials, on NCIS: LOS ANGELES, Sunday, March 18 (9:00-10:00 PM, ET/PT) on the CBS Television Network. “Goodbye, Vietnam” – Callen, Sam, Kensi and Deeks join Hetty’s team from the Vietnam War, Sterling Bridges (James Remar), A.J. Chegwidden (John M. Jackson) and Charles Langston (Carl Lumbly), in a dangerous and off-the-books rescue mission to save Hetty from her captors in Vietnam. Also, Mosley calls in Nell’s sister, homeland security specialist Sydney Jones (Ashley Spillers), to assist the team in Los Angeles with processing evidence connected to Hetty’s time in Vietnam, on NCIS: LOS ANGELES, Sunday, March 11 (9:00-10:00 PM, ET/PT) on the CBS Television Network.